1) For both areas, polar bears have regularly used these fringe areas of their range during their critical spring feeding period over the last 30 years — because over the last 30 years, spring sea ice has declined only slightly (Fig. 1). A seasonal change in use is not a true “change in distribution“ — a real “change in distribution” means no longer found in an area once known to be present. 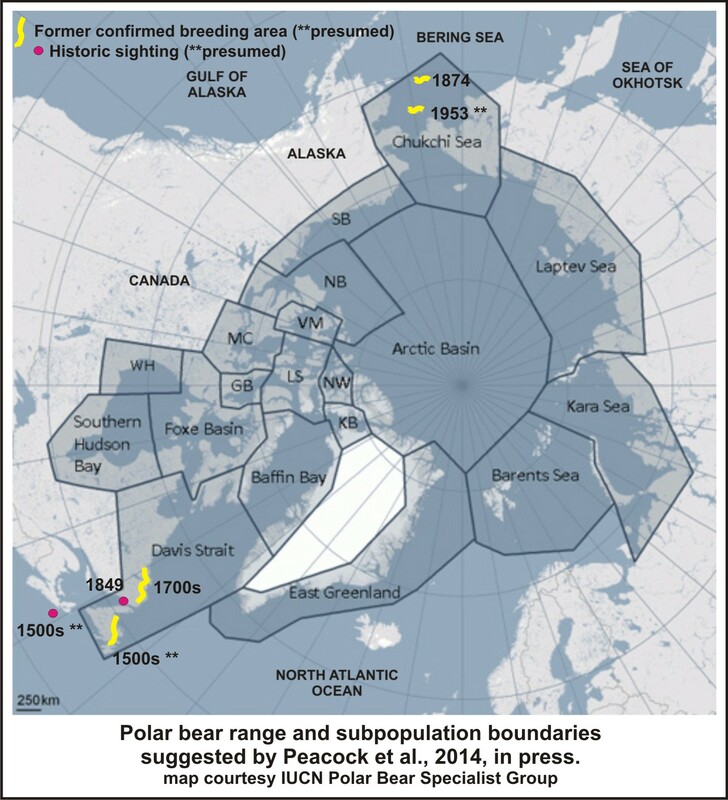 Note that the current map of polar bear distribution includes St. Matthew Island in the Bering Sea as well as Newfoundland (Fig 3), as polar bears are still found there in at least one season of the year. 2) In the west, polar bears of the Bering/Chukchi Sea don’t require land for denning — most bears in that region are known to spend their summers, and make their dens, on the sea ice. Recent studies have shown that even without the summer-use grounds on St. Matthew and St. Lawrence, the bears of this region are doing very well. 3) In the east, historic records show that polar bears may have used southern Labrador as a maternity denning area during the cold period of the Little Ice Age (ca. AD 1500 to AD1880), when there was more extensive ice than today. However, during the earlier Medieval Warm Period (ca. AD 800 to AD 1500), when it was much warmer than today, such winter denning and summer-use would not have been possible. Newfoundland and southern Labrador cannot truly be considered ‘traditional’ denning or summer-use areas, and not surprisingly, bears in this region are doing well without using these areas in summer. Figure 1. March sea ice extent 2014 compared to the 1981-2010 average. One thing biologists have learned is that when the population size of a species declines dramatically – as polar bear numbers did due to the wanton slaughter of the late 1800s and early 1900s – it’s total range very often contracts. I have experience with this concept because I documented an interesting example. Pacific bluefin tuna (Fig. 2, some more than 2 metres in length) were formerly taken by aboriginal Nuu-chah-nulth hunters off the west coast of Vancouver Island in late summer (from about 5,000 years ago until the early 1900s). Bluefin tuna of this size have not been recorded so far north in the eastern Pacific since — in any season – not because of climate change, but because their overall population size declined so much that the former overall range contracted (Crockford 1997). Figure 2. Prehistoric giant bluefin tuna tail vertebrae of a fish about 2.0 metres long, from a site on the west coast of Vancouver Island, British Columbia. If there was a slight range-contraction of polar bears after the significant decline in population size in most areas between the late 1880s and the 1960s, it has largely recovered. 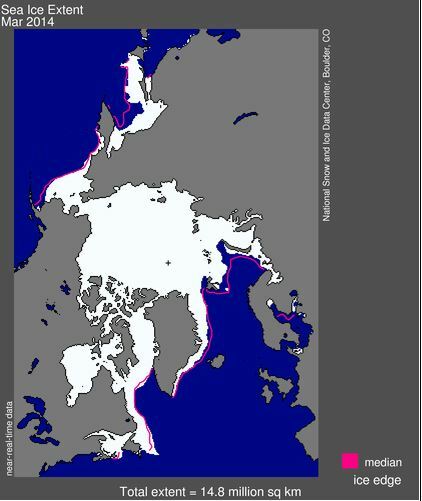 The range of polar bears is currently defined by the maximum spring (March/April) extent of contiguous sea ice. Lack of summer occupation and fall denning onshore in a couple of areas at the very fringe of that range does not constitute the kind of “change in distribution” seen in Pacific bluefin. Peacock and colleague’s “evidence” for claiming a slightly larger former denning and summer-use range for polar bears is summarized in the map below, from these references: Elliott 1876, Packard 1886; Rausch 1953, Smith et al. 1975. Figure 3. Summary of evidence contained in the references presented by Peacock et al. 2014, in press, proposed as a recent range-contraction for polar bears. 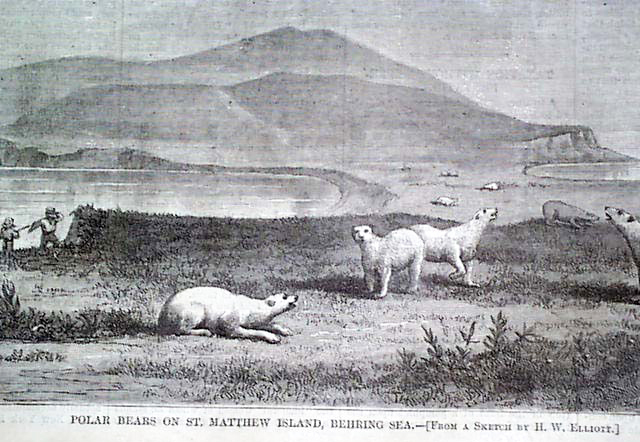 Note that St. Matthew Island in the Bering Sea (see Figure 3, the 1874 date; and Fig. 4 below, circled), as well as all of Newfoundland (Fig. 5), is still considered within the official range of polar bears. This is in any case almost certainly an under-estimation, because most years spring sea ice extends beyond St. Matthew Island (Fig. 4), taking polar bears (and their Arctic seal prey) with it. The same is probably true for bears in eastern Canada when sea ice extends well beyond Newfoundland, as it did last year. Figure 4. 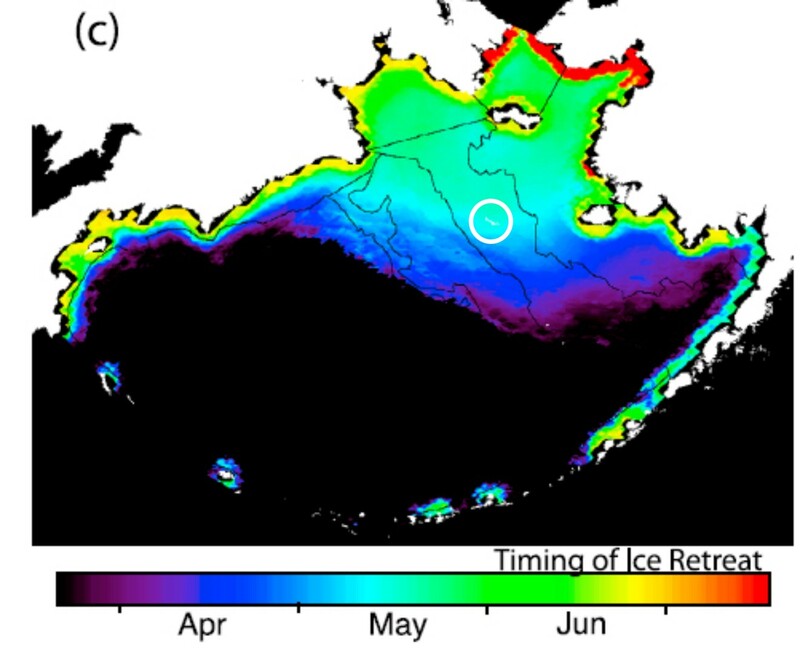 Mean timing of sea ice retreat for 1979-2009, from Brown et al. 2011, which also shows the mean maximum spring sea ice extent beyond St. Matthew Island (circled, added by me). Note that Peacock and colleagues provided no evidence at all for their claim that now polar bears are “irregularly observed in the Bering Sea.” Not a single reference to support that assertion. And as for Newfoundland — where Peacock et al. claim polar bears are seen “infrequently and in small numbers” (again without a reference to back it up) — that allegation is particularly surprising. That’s because polar bears have been sighted fairly regularly in spring around the northern Newfoundland community of St. Anthony (Fig. 6) in recent years (discussed below). That shouldn’t be astonishing, since the size of the Davis Strait population has almost doubled since the late 1970s (discussed here). Southern Davis Strait bears in particular have been doing very well. This suggests that few late 20th century records of polar bear sightings in this region reflected an over-hunted population that has only recently recovered. Figure 5. This is Fig. 1 from Peacock et al. 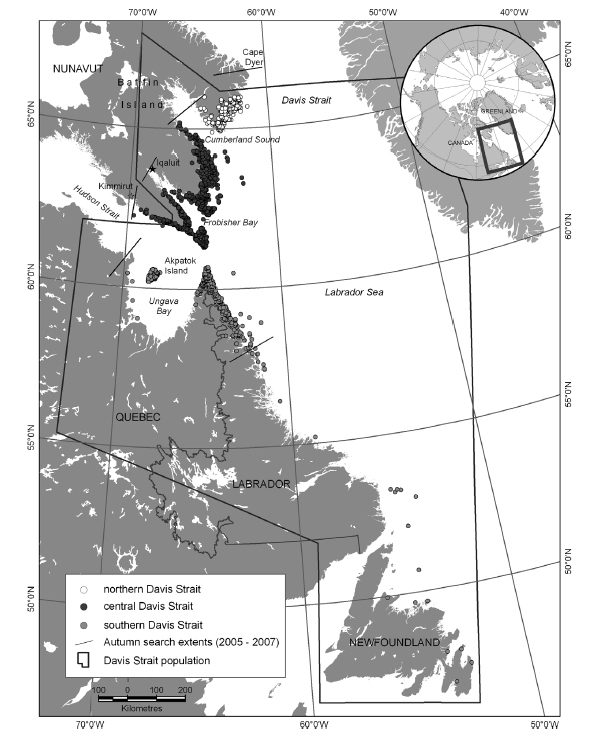 2013 (discussed here and here), a compilation of survey data of polar bears in Davis Strait from 1974-2007. Note the location of captures along the northern coastline of Newfoundland (dates not given). Click to enlarge. While Peacock and colleagues (2015) claim that polar bears were “once common in Newfoundland,” that statement is not as well supported as they make it sound. They cite “Smith et al. 1975.” I could not locate a copy of this report but I did find a copy of its followup study, published in 1980. Stirling and Kiliaan (1980) summarized the historical documents provided in Smith et al. 1975, and discussed the distribution issue. Stirling and Kiliaan also considered that the low incidence of maternal denning in northern Labrador in the late 1970s, was primarily the result of illegal hunting of females — that suitable denning habitat was available but was unused. They did not seem to consider that the overall low numbers of polar bears in the 1970s (due to decades of over-hunting) would also have affected the number of bears sighted in southern Labrador and Newfoundland. “Polar Bears are a regular sight in Black Tickle [southern Labrador, opposite the north tip of the Great Northern Peninsula of Newfoundland] during the winter and this year it has been no different. See reports of recent (2012-2014) Newfoundland sightings here, here, here, and here. Figure 6. 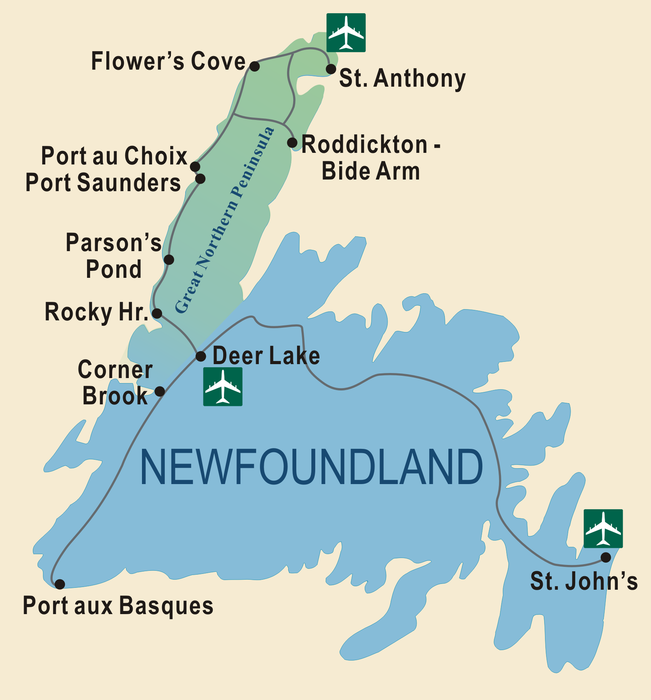 Location of St. Anthony’s on the Great Northern Peninsula of Newfoundland. An archaeological site at the Viking site of L’Anse aux Meadows, on the most north-western tip of Newfoundland (beyond St. Anthony, Fig. 6), was occupied about 1000 years ago during the Medieval Warm Period (ca. AD 800 to AD 1500). The site contains evidence that the area was much warmer than it is today and had an associated warmer-than-today set of flora and fauna (Ogilvie et al. 2000) — suggesting the phenomenon of natural sea ice fluctuations in Davis Strait made by Vibe (1965, 1967) continued further back in time. This evidence of past climate change indicates that the north coast of Newfoundland (and southern Labrador) could not have supported summering or denning polar bears during the warm centuries of the Medieval Warm Period, as is also true today (see also Steve McIntyre’s summary of “Important New North American East Coast Proxy Data” from two sites on Newfoundland, including one on the north shore). The historical records of polar bear occupation of this area cited by Peacock and colleagues all date to the Little Ice Age period (ca. AD 1500 to AD1880), when sea ice would have been, in general, much more extensive. The claim that polar bears have suffered a contraction of their range due to recent sea ice declines is unsupported by fact. No one has attempted such a specious assertion before and now you know why — it does not hold up to scrutiny because it is simply not true. A decline in summer use of fringe areas does not constitute a “species range contraction” as it is usually defined. “In conclusion, it appears, from the movement data gathered to date, and the almost total absence of data of any kind on maternity denning on the Labrador coast, that a large proportion of the polar bears found there originate from other areas. The observations of polar bears (summarized in Smith et al. 1975) on and around the island of Newfoundland by Cabot in 1497 (Markham 1893) and Cartier in 1534 (Stephens 1890), in southern Labrador by Cartwright (Townsend 1911) in the 1770’s and along the entire Newfoundland coast by Grenfell (Grenfell et al. 1913) all fall within pulsation stages as determined by Vibe. Historical records suggest that there may have been more polar bears in Labrador in earlier times but the data available are not sufficiently detailed to be clear on the point. Nor do the records we are aware of specifically mention maternity denning. However, in most years the pack ice does not drift far enough south until December, so that some pregnant female polar bears may not be transported to the Labrador coast in time to den. This would, of course, preclude maternity denning except by females that had spent the summer along the northern Labrador coast. Based on our experience in other areas of the Arctic, it is our subjective impression that suitable habitat for maternity denning is relatively abundant in northern Labrador. However, even though maternity denning may have occurred in the area in the past (Brice-Bennett 1977), albeit to an unknown extent, the present data suggest that little, if any, maternity denning now occurs along the northern Labrador coast. If the incidence of maternity denning has decreased, it may have been caused by long-term climatic changes that affected the southerly drift of the pack ice, excessive hunting pressure, or a combination of the two…. Crockford, S.J. 1997. Archaeological evidence of large northern bluefin tuna, Thunnus thynnus, in coastal waters of British Columbia and northern Washington. Fishery Bulletin 95: 11-24. Open access http://fishbull.noaa.gov/951/951toc.htm Pdf here. Elliott, H.W. 1875. Polar bears on St. Matthew Island. Harper’s Weekly Journal of Civilization. May 1 issue. Harper and Brothers, New York. Packard, A.S. 1886. The former southern limits of the white or polar bear. American Naturalist 20(7): 655–659. http://www.jstor.org/stable/2450582?seq=1#page_scan_tab_contents Open access pdf here. Rausch, R.L. 1953. On the land mammals of St. Lawrence Island, Alaska. Murrelet 34: 18–26. pdf here. Stirling and Kiliaan. 1980. Population ecology studies of the polar bear in northern Labrador. Canadian Wildlife Service Occasional Paper No. 42. Smith, P., Stirling, I., Jonkel, C., and Juniper, I. 1975. Notes on the present status of the polar bear (Ursus maritimus) in Ungava Bay and northern Labrador. Canadian Wildlife Service, Progress Notes 53. 8 p.
Vibe, C. 1965. The polar bear in Greenland. In, Proceedings of the First International Scientific Meeting on the Polar Bear. Fairbanks, Alaska 6-10 September 1965, IUCN Polar Bear Specialist Group. University of Alaska International Conference Proceedings Series, No. 1. pg. 17-25. Washington, DC. pdf here. Vibe, C. 1967. Arctic animals in relation to climatic fluctuations. Meddelelser om Grønland. 170(5). C. A. Reitzels Forlag, Copenhagen. This entry was posted in History, Sea ice habitat and tagged climate change, global warming, Gulf of St. Lawrence, Labrador, Little Ice Age, Medieval Warm Period, Newfoundland, range, range contraction, sea ice, St. Lawrence Island, St. Matthew Island, Vibe. Bookmark the permalink.